IP law has evolved from being a little pool to a big ocean. Corporate governance needs to respond to society’s rising expectations of directors and boards as the impact of the global intellectual property ecosystem is felt. How can a responsible corporate culture of IP transparency be stimulated to create a rosy future to connect corporate communication with the desires of shareholders, investors and other stakeholders? The astonishing lack of material quantitative and qualitative information companies report about their IP assets makes it difficult for shareholders and other stakeholders to assess directors’ stewardship of those assets – a pressing corporate governance issue in the 21st century. This book advances IP reporting in alignment with the key corporate governance principles of transparency and disclosure. 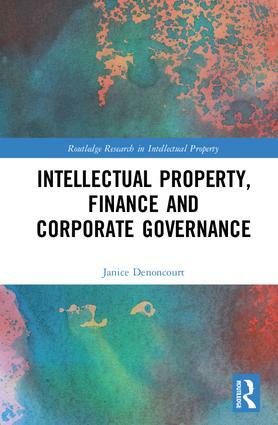 It analyses the juncture between the IP ecosystem; corporate finance and accounting for intangibles; and corporate governance. Patents, mini-case studies and an original business triage style model for assessing IP disclosures are used to illustrate the gaps corporate governance theory needs to address. Focussing on the common law tradition of corporate governance in England and Wales, intangibles and IP reporting developments in other jurisdictions are also explored. 4 True and fair patent valuation: a corporate governance issue?